We are witnessing the transformation of developing countries into vibrant economies, which requires us to deal actively with the challenges of sustainability and resource efficiency. 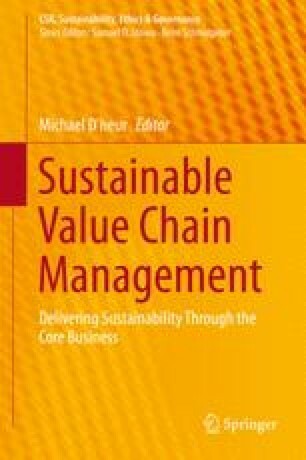 This article describes the Henkel Sustainability#Master®—a holistic product assessment based on life-cycle thinking that takes both value creation and product footprint into account. In this paper, the authors illustrate how this concept is successfully applied in practice. Footprint Network. (2013). http://www.footprintnetwork.org/. Accessed 04 May 2014. Forum Waschen. (2013). Fakten zur Verwendung von Palmkernöl in Wasch-, Pflege- und Reinigungsmitteln in Deutschland (Status 28 March 2013). http://forum-waschen.de/. Accessed 4 May 2014. RSPO. (2013). Roundtable on sustainable palm oil. http://www.rspo.org. Accessed 04 May 2014. United Nations. (1987). Report on the world commission on environment and development, “Our Common Future” presided over by Gro Harlem Brundtland. http://www.un-documents.net/ocf-cf.htm. Accessed 11 June 2013. UNDP. (2013). Human development report. http://hdr.undp.org/en/2013-report. U.S. Foreign Agricultural Service. (2014). http://www.fas.usda.gov. Accessed 04 May 2014.